The azaleas belong to the Ericaceae family, a group of plants that also includes mountain laurel, blueberry and the cranberry. Azaleas come in evergreen and deciduous forms, growing for the most part as shrubs and capable of generating colorful, vibrant flowers. 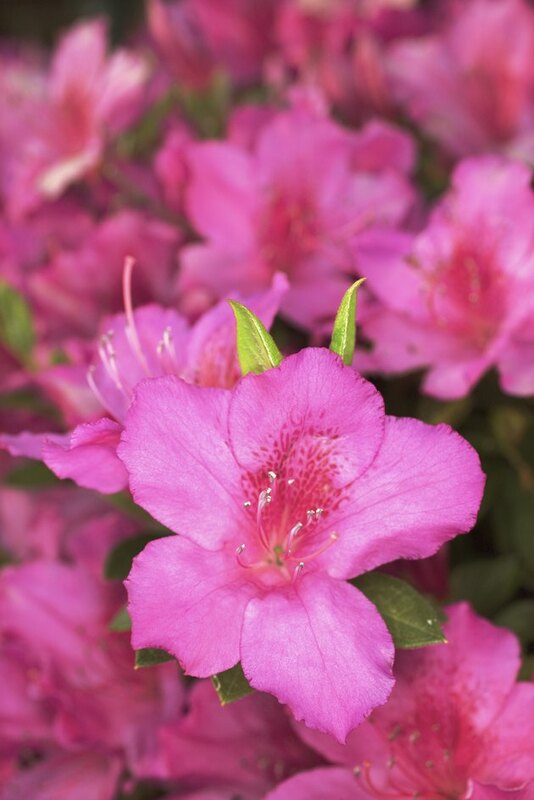 The different azaleas, often cultivars with catchy names, produce flowers in an array of colors. Azaleas come in an assortment of colors. 'Wahsega' is a cultivar of the flame azalea, Rhododendron calendulaceum, which features a deep red flower. Flame azaleas are cold hardy to U.S. Department of Agriculture plant hardiness zone 5, but fare poorly in zones warmer than zone 7, notes the University of Connecticut Plant Database. 'Wahsega,' like many azaleas, stands alone as a specimen shrub or works in groups. Plumleaf azalea, Rhododendron prunifolium, is a Georgia and Alabama native shrub, growing to 12 feet high and known for its red flowers in July and August. Plumleaf azalea is deciduous, handles damp areas and favors acidic soil. Rhododendron 'Golden Lights' is a deciduous azalea that blooms yellow in May. Growing between 3 and 6 feet, Golden Lights is a shrub for partial or full shade, making it suitable for along foundations or in woodland gardens. It is cold hardy between USDA zones 3 through 7, as opposed to My Mary, a cultivar for zones 5 through 8. It too has yellow flowers, with the blooms emerging as early as April. 'My Mary' grows to 6 feet in partly shaded sites. Rhododendron 'Herbert' is a small, evergreen azalea hybrid brought to fruition in Pennsylvania. It grows to 3 feet, with purple flowers and shiny green foliage. 'Herbert' works in spots that get sun in the morning and shade in the afternoon. Rhododendron 'Girard's Fuchsia' is suitable for USDA zones 6 through 9 and it is particularly appropriate for regions like the Pacific Northwest. It grows to 4 feet, remains evergreen and generates plenty of red-purple flowers in April, with some as wide as 3 inches. Pink azalea forms are abundant, but one of the tallest is the mountain azalea, Rhododendron canascens. It grows to 15 feet in the southeastern states in partial shade; full sun sites often result in scorched leaves during the summer. Mountain azaleas are pink and they survive between USDA zones 6 and 9. On the other end of the size spectrum is Rhododendron 'Dr. H. R. Schroeder,' growing sometimes to just 18 inches. Cold winters between zones 5 and 7 do not keep the foliage from staying dark green. This hybrid form features pink flowers in April and May.